Spring Arena, MLG's StarCraft II tournament, began this past weekend with eight players vying for a chance to move on and compete in the second Spring Arena, taking place May 18-20th. Unfortunately, North American native and Protoss player HuK placed eighth. It's okay HuK, I still believe in you. 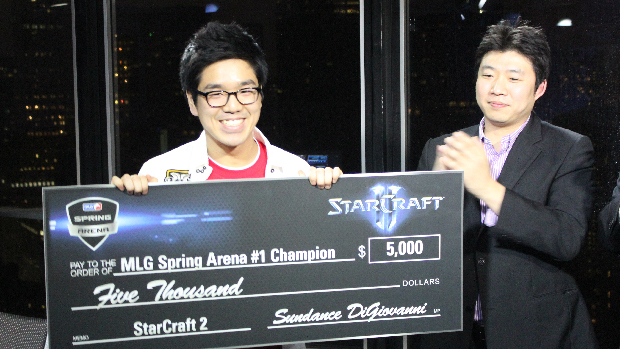 DongRaeGu, from team MVP, took first place with his always-impressive Zerg play and took home $5,000. Personally, I find playing Zerg the most difficult since I'm terrible at managing my expansions, so seeing someone do it so easily is incredible to me. The top four will advance to the second Spring Arena while the bottom four will advance to the invite-only online qualifiers this weekend. Speaking of which, all three Protoss players ended up in the bottom four, while all three Terran players were in the top four. I blame Marauders.